If you've completed all 4 Passes, You Need A Breathless Agony Jersey!! The road up to Onyx Summit has some steep ups and downs through Barton Flats followed by a long endless climb to Onyx Summit. However, there is really great scenery as you climb up and up above the clouds!! And did I mention THE PARTY at the top? It was a really great time this year with the largest field ever to make it to Onyx Summit!! In Part 1, check out 66 Photos from the party at Onyx Summit. In Part 2, check out 58 Photos from the continuing party at Onyx Summit right up to the end. It was great fun to share the joy of these cyclists arrving at THE TOP!! These 124 photos show how great of a time it was at the Onyx Summit Party this year!! Peg Phillips did so much for the ride by leading Registration before the ride, handling Registration at the Ride Start, managing Rest Stop 2 and Rest Stop 4 ... we could have never done it without her incredible help this year so a BIG THANKS to Peg!! We were amazed at the number of 4 Pass Finishers this year ... in 2000, there were 23 riders who made it to the top at Onyx Summit, in 2001, there were 36 and in 2002, there were 91 Riders who made it all the way to Onyx Summit!! What a difference a Cool Jersey makes!! Congratulations to everyone who made it!! Special recognition goes out to the top 3 Women: Mavis Irwin, Lorraine Gersitz, and Kelley Swanno as well as the top 3 Men: Bob Davidson, Brian Bowling, and Vincent Tortorich!! These folks were flying up all of those climbs and a big congratulations to them. 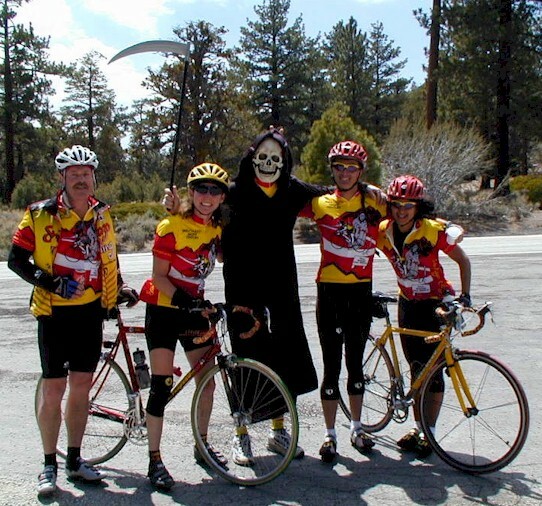 A major tip of the hat to Dan Gorman and Doris Bingo who rode their tandem up all 4 Passes of this really tough ride. There has only been one other couple who have ridden their tandem all the way up to the top: In 2000, Michael Kantner and Laura Needels made it all the way to the top in 7:13. Dan and Doris completed it in 7:05 this year ... setting a new Tandem Course Record!! A tip of the hat to the Veloce Santiago Team for their support of this most difficult ride ... there was a huge turnout this year and many, many Santiago Cyclists made it to THE TOP!! Congratulations! !